Kitchener PUC 141 (above) has arrived at the Rockway Centre (Kitchener Jct.) terminal for the very last time. It is approximately 9:30 am on the final day of trolley coach operation. The trolley coach has just been removed from service and the driver has switched to a diesel powered bus. A service person will shortly move 141 across the street to the trolley coach storage area behind the bus garage. There he will lower and hook down the trolley poles. He will then bring a diesel bus from the garage to the terminal to trade-off the next arriving trolley coach. This process will be repeated until all the trolley coaches have been replaced by GM T6H5307N diesel buses bringing the era of trolley coach operation in Kitchener and Waterloo to an end. Street railway service in the city of Kitchener came to an abrupt end on December 27, 1946, 59 years after service first began. Abandonment had been scheduled for December 31, however, a severe sleet storm hit the Southern Ontario area on the evening of December 27 causing the old streetcar overhead wire to snap in three places. As well, the rails filled with ice and snow completely shutting down the service. The cost of repairs could not be justified when only four days remained until trolley coaches were to go into operation replacing the streetcars, thus ending the streetcar service prematurely. New Year's Day 1947 saw the introduction of trolley coach operation on a single 4.5 mile route along King Street in the twin cities of Kitchener-Waterloo. (The City of Waterloo purchases its transit service from the City of Kitchener). Initially ten Brill T44 trolley coaches were obtained from Canadian Car & Foundry to implement trolley coach service. As the result of a higher than expected increase in ridership, another five were purchased in 1948 and one more in 1949. When Ottawa shut down their trolley coach operation, Kitchener PUC picked up five T48A coaches from there. 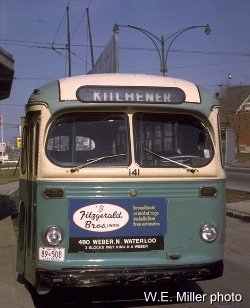 These came in September 1959 and were destined to be the last trolley coaches purchased by Kitchener. All trolley coaches remained in service, until replaced by diesel buses in 1973, with one exception. An electrical fire caused heavy damage to #119 on December 28, 1970 and it was scrapped as a result. Following the morning rush hour on March 26, 1973, diesel buses replaced the trolleys as they arrived at the Kitchener end of the route. With the arrival of trolley coach #107, the era of electric public transit in the city of Kitchener drew to a close. The disposal of the trolley coaches and dismantling of the overhead wires was swift. All 20 remaining trolley coaches were sold to BC Hydro, Vancouver, BC in April 1973, along with a collection of new and used parts for $48,420 (Kitchener newspaper - 'The Record', April 27, 1998). The coaches were placed on railway flatcars for shipment to British Columbia. None ever operated in Vancouver to my knowledge, but supplied components for new Flyer trolley coaches in the 2601-2650 series. Galt Iron & Metal Co. purchased the approx. 36 miles of copper over-head trolley wire for $43,640 (Kitchener newspaper - 'The Record', April 27, 1998). March 26, 1973 also brought with it a change in the name of the public transit system in Kitchener/Waterloo. On that date it became known as Kitchener Transit*, with the fifteen new General Motors T6H5307N's purchased to replace the trolleys, introducing the new name and paint scheme. * On January 1, 2000, Kitchener and Cambridge Transit systems were merged to form Grand River Transit. All, except 119, sold to BC Hydro, Vancouver, BC in April 1973 for parts. When loaded on railway flatcars, the trolleys moved from Kitchener via the Grand River Railway to Galt, ON, Canadian Pacific to Abbottsford, BC, then BC Hydro to destination. Coaches 111, 115, 127, 135, 137 & 141 departed Galt on CP train First 52, May 17, 1973 at 12:45 pm on CP flatcars 301710, 303306, 301317, 303458, 301728 & 303454 resp. Coaches 101, 107, 109, 113, 121 & 131 departed Galt on CP train #50, May 19, 1973 at 2:45 pm on CP flatcars 301661, 303576, 301423, 301721, 301155 & 303250 resp. Coach 117 departed Galt on CP train #74, May 20, 1973 at 8:50 am on CP flatcar 303294. Coaches 103, 123, 125, 129 & 133 departed Galt on CP train #50, May 20, 1973 at 11:05 am on CP flatcars 301290, 301183, 301070, 301723 & 301566 resp. Coaches 105 & 139 departed Galt on CP train #74, May 23, 1973 at 7:30 am on CP flatcars 301146 & 303236 resp.